Stuffed Bell Peppers are a classic American dish, that is an all-in-one meal. You get your meat and veggies in one delicious dish, although, I do like to serve them with a side of french fries. This filling in the peppers is very similar to a meatloaf recipe. Just like meatloaf, there are many different recipes for Stuffed Bell Peppers, but this is my favorite one I have come across so far. It is flavorful with sauteed onions and garlic, and just the right amount of seasoning. 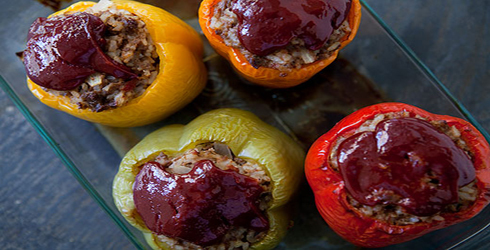 The ketchup sauce on top adds a bit of spice, and helps make the Stuffed Bell Pepper filling moist and delicious. If you wanted to add a little more veggie to this recipe, you could finely chop one carrot and mix it in with the rest of the filling ingredients before stuffing each pepper. Summary: Stuffed Bell Peppers are a classic American dish. You get your whole meal in a delicious edible container. Bring a large pot of water to a boil over high heat. Meanwhile, cut the top off peppers 1 inch from the stem end, and remove seeds. Add several generous pinches to boiling water, then add peppers and boil, using a spoon to keep peppers completely submerged, until brilliant green (or red/yellow/orange) and their flesh is slightly softened, about 3 minutes. Drain and set aside to cool. Preheat oven to 350°F. Heat 4 tablespoons of oil in a large skillet over medium heat. Add onions and cook, stirring often, until soft and translucent, about 5 minutes. Add the garlic and cook a minute more. Remove skillet from heat. In a large bowl add the onions and garlic, meat, rice, tomatoes, and oregano, and season generously with salt and pepper. Mix well. Drizzle remaining 1 tablespoon of olive oil inside the peppers. Arrange the cut side of the peppers up in a baking dish, then stuff peppers with meat filling. Combine the ketchup, cumin, Worcestershire, hot sauce, and honey in a small bowl, then spoon over filling in peppers. Add ¼ cup of water to the baking dish. Place in oven for 40-50 minutes (or longer, depending on how big the peppers are that you are stuffing), until the internal temperature of stuffed peppers is 155°F.